Blessed Teresa of Calcutta, MC will be canonized into sainthood this September. Who doesn’t know of her? Heck, I posted an article about her some six years ago. The wonders of her spiritual health challenges. The wonders of her depression. Received an email from Amelia Carruthers of Oxford University Press. She’d visited Chipur and thought I’d be interested in a post on their blog. I checked-it-out, and in short order inquired if I could run with it as a guest article – permission granted. So I bring you the guest article, “Unwholly bound: Mother Teresa’s battles with depression.” The author is George Graham, Professor of Philosophy, and Adjunct Faculty in the Neuroscience Program at Georgia State University. He is the author of The Abraham Dilemma: A Divine Delusion. What does spiritual health not involve? The first thing not to say is that there is a single capacity or ‘mental faculty’ for spirituality in the human mind. Nothing could be further from the truth – there is no single spiritual capacity. Consider the numerous and heterogeneous mix of concepts that are considered spiritual or religious. Some concepts refer to supernatural agents (like spirits, gods, or God); others do not. Some concern afterlife beliefs, others ritualistic practices, still others involve sacred objects and holy persons. Some spiritual concepts are elements of our regular cognition, religion or no religion. Things like moral concepts (fairness and proportionality for example) are present in young children, long before they believe in a god. The second and related thing not to say, is that spiritual health is the same general condition for each and every ‘healthy’ person. Again, it is not. There is wide variation in the particular character of people’s spiritual health. For some, belief in God contributes to spiritual health. For others it does not. For certain individuals, membership in a religious community contributes to spiritual health – for others, it can even raise psychological issues! The third and last thing not to say is that spiritual health is unbounded, unconstrained by human limitations of personality, culture, and circumstance. In the cognitive science of human decision making and reasoning, investigators write of something called ‘bounded rationality.’ This concept recognizes situational constraints and personal limits on human decision making. No person is a perfect or Olympian reasoner. We get confused, we may be uninformed, and we make mistakes. Time is often not on our side. To illustrate this point, I’d like to take a brief look at someone who, although iconic in her religiosity, may not have been spiritually healthy. Consider Mother Teresa of Calcutta. She died in 1997. After her death, a book entitled Come Be My Light: The Private Writings of the Saint of Calcutta appeared. It holds a selection of her letters and diary entries, and was edited by Brian Kolodiejchuk, a priest. Surrounds me on all sides – I can’t lift my soul to God – no light or inspiration enters my soul . . . Heaven, what emptiness – not a single thought of Heaven enters my mind – for there is no hope…The place of God in my soul is blank. Prayer for many people is crucial to their presumed relationship with God. It helps to make him seem more real, more available. It did not do so for Teresa. As Mother Teresa aged, she became more circumspect in her writing. However, her thirst for intimacy with God was never satisfied. Was her strife and emotional darkness compatible with spiritual health – bounded, and humanly constrained? Reports from the Vatican indicate that Mother Teresa will soon be canonized. Alas, the future saint may have suffered needlessly due to an absence of psychiatric medical treatment. Apparently, the Church never considered that option for her. Mother Teresa received pastoral counseling, but it was cloaked in a somber and discouraging theology. Suffering from a felt absence of God, some of her counselors urged, was God’s way of drawing her close to him. This reading of her state of mind understandably did not reduce her misery. Perhaps she would have rejected secularized psychiatric attention, but unfortunately, we will never know. Mother Teresa’s depression hung on her like an “unwholly weight” – making its full impact felt on a person who spent decades mired in conditions of abject poverty, illness, and death. As an important lesson to remember, it’s far from clear that this saint in Calcutta was spiritually healthy. Bound, or unbound. Thank you, Professor Graham, for the article. You gave us much to consider. And thank you Amelia Carruthers for the email and tip. Glad we all got together. 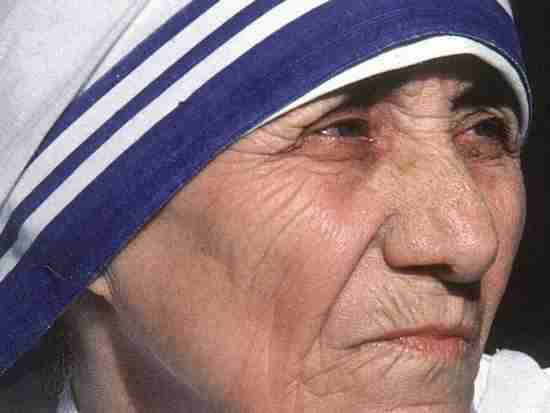 So, the Mother Teresa you may not have known. Yes, we’re aware of her work – even her Nobel Peace Prize. But who would have thought she struggled so deeply with spirituality – and depression? Actually makes her much more human to me, in spite of being a soon-to-be saint. If you’d like to read the article on the Oxford University Press blog, have at it. And if you’d like to peruse 675 Chipur titles, they’re waiting for you. Previous Post: We all thought it was a cool tattoo. Who knew it was your second brain?